A commemoration of the legacy of Martin Luther King Jr. brought together people of all cultures, backgrounds and ages from across the Diocese of Austin. The annual event was held Jan. 12 at St. Louis Parish in Austin. Auxiliary Bishop Fernand Cheri of New Orleans was the keynote speaker. 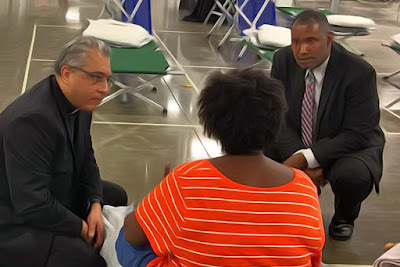 He was joined by Bishop Joe Vásquez, Auxiliary Bishop Daniel Garcia and Father James Misko, pastor of St. Louis Parish and the recently appointed vicar general of the Diocese of Austin. Bishop Cheri said changing lanes is a part of life and one should not simply give up as soon as life throws a curve ball. Invoking King’s words, “Let no man pull you low enough to hate [him],” Bishop Cheri encouraged people to not place limitations on themselves because in changing lanes people should not allow the past to paralyze them in the present. This comment resonated with the staff of the diocesan Office of Life, Charity and Justice. Luisa de Poo, the associate director for Pro-Life Activities, said she often cautions those who have endured obstacles of racism or injustices to not live in a wound. Bishop Cheri challenged the faithful to not let events that happened to them in the past stop them from moving forward or discourage them from accomplishing their goals. Reflecting on the presentation, Wilhelmina Delco said, “I took away from his message that life is full of change and you should not be afraid to change lanes.” Delco knows about change as she was the first woman and the second black speaker pro tempore of the Texas House of Representatives. The St. Augustine Choir from Holy Cross Parish opened the service with an African hymn, “Siyahamba.” The hymn was meant to emphasize a spirit of community from the perspectives of those from the African diaspora. The choir from St. Louis Catholic School, in songs written by Michael Hoffer, reminded participants to follow the path of the Lord because God gives the courage to brave the storms of life. Belizean drummer Bernard Busano of St. William Parish in Round Rock and the Danza Guadalupana of St. Louis Parish in Austin led the march after the program. Busano represented a drum major, and the Guadalupanas represented the growing and varied Hispanic cultures present in the diocese. The choir and dance ministry from Holy Cross Parish helped participants praise, worship and witness through the Word, particularly in “Koinonia,” a song by V. Michael McKay which challenges the faithful to love each other with the love of the Lord. Geraldine Jones of St. Joseph Parish in Killeen and Patricia Macy of St. Austin Parish led the congregation in a litany and prayer for promoting harmony and justice. Dorsey, who retired a year ago as the diocesan director of Black Catholic Ministry, was surprised and humbled to receive the award. “As I walked up the aisle to receive the award from Bishop Vásquez, I was overwhelmed by the thought that I had been chosen to receive this very meaningful award. Dr. King’s legacy has led to changes in law and social justice and I am humbled to know that I received an award that carries some of the greatest words that Dr. King has spoken,” Dorsey said. Bishop Vásquez was pleased with the diversity of those in attendance at the commemoration for King. “There were people of different race, culture and language which is a great sign since honoring the life of Dr. Martin Luther King should never be seen as exclusive to one ethnicity,” the bishop said. In consultation with the diocesan offices of Social Concerns and Hispanic Ministry, the commemoration program was coordinated by the diocesan Black Catholic Advisory Committee under the leadership of Susan Morris of St. Louis Parish in Austin. DeKarlos Blackmon, the diocesan secretariat director of Life, Charity and Justice who also coordinates the Office of Black Ministry, said it was paramount to make the King celebration inclusive of all. “This commemoration was a visible sign that we can all sit around the table of the Lord without regard to distinction, expressing in the words of St. John Paul II that there is no black church, no white church, no American church, but the one church of Jesus Christ that is a home for blacks, whites and people of every culture and race,” Blackmon said.